This is your chance to do something not even .1% of the population has done, but now you can. In small-groups between 2-10 people you can potentially climb multiple old-growth trees, between 150 and +250 feet high. See the unique perception and feel what it's like to be a bird or a monkey as you climb/swing through the open air and catch branches, harnessed by top rope. 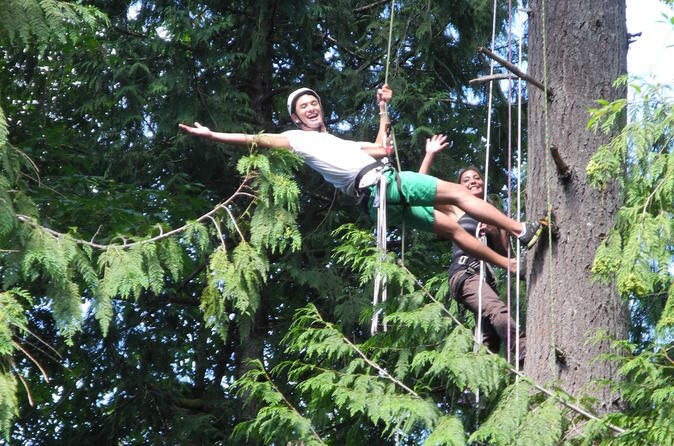 Climb your way up some of the tallest trees in the world to amazing views while learning and connected to nature like you have never done before, beyond the trail. Don’t deprive yourself of this amazing and unique experience. This is your chance to do something not even .1% of the population has done, but you can. This is a half day experience located at Deception Pass State Park. We climb on multiple trees, between 150 and +250 feet high. Depending on the group and the climbers' ability, you will ascend one or two trees. Canopy climbing can be physically and mentally challenging for some. We suggest all participants bring snacks and water, besides, eating in trees is fun. Also wear athletic clothes and athletic shoes. All other equipment will be provided. The canopy tree climbing experience is a progression. You will start first by receiving all of your equipment, followed by safety talks, learning about the equipment, learn how to use the equipment to climb and then start climbing! We keep it simple and easy to make sure you are having fun, learning and especially safe. Reservations Required.